Don’t give up taste to get the power of Whey Protein Isolate. The ultimate in taste, the ultimate in convenience – Allmax Whey Protein Isolate Isoflex stakes its claim as the last word in high performance nutrition. There are NO substitutes. 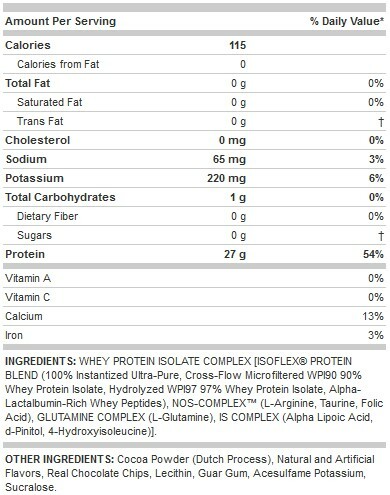 Allmax Whey Protein Isolate Isoflex Contains 25g Whey Protein. With 7 critical co-factors in 4 proprietary complexes, Allmax Whey Protein Isolate Isoflex provides not only an ultra pure highly bioavailable whey protein isolate, but also a potent delivery system to ensure powerful nutrient assimilation you can feel. Allmax Whey Protein Isolate Isoflex combines four proprietary delivery systems. The ingredients in each system work synergistically to provide a high quality and great tasting protein powder that’s been designed to help you reach your goals.